When gum recession on the gingiva (gums) occurs, the body loses a major natural defense to bacteria! To prevent bacteria and further trauma, gum reconstruction using a gum graft may be necessary. What is causing Gum Recession? Sometimes if only minor recession if occurring, there is enough healthy gingiva left to protect the tooth. In these instances, no treatment other than modifying dental care habits are necessary. But when a root has become exposed or decayed, the problem needs to be dealt with. Gum recession can also cause root sensitivity to hot and cold foods as well as an unsightly appearance to the tooth as the gum becomes exposed. Additionally, as the gum recedes, so does the bone, which can ultimately lead to more problematic issues. What Can be done to Correct the Problem? The first way we can correct gum recession is to use the adjacent gum tissue to repair the recession. The limiting factor is how much adjacent gum tissue is available from the graft site. We can perform what is called a ‘gingival graft’ that can correct the issues you may be experiencing. The second way is to use the patients own gum tissue (called an ‘autograft’) which is tissue taken from the roof of the mouth and then grafted directly to the affected area around the teeth. The third way is to fix the recession using a grafting material called ‘AlloDerm’. AlloDerm was introduced back in 1994 and was used initially in burn reconstruction and in head and neck plastic surgery. At South Calgary Periodontal, we will give you strict post operative care instructions after any gum grafting procedure. These instructions need to be followed closely to ensure the success of your gum grafting procedure. We will then see you on a regular basis to check your post-operative care. We will also provide you with an after hours number to call in case of any emergency. Receding gums are unsightly and painful. Do your best to prevent -and if necessary, to treat gum disease – in order to minimize the recession that you will have in your mouth. Pay attention to how you brush and floss on a daily basis. Make sure to go in circles using a soft brush. Do not be afraid to try an electric or mechanical toothbrush as they often help break the habit of sawing back and forth with a conventional toothbrush. 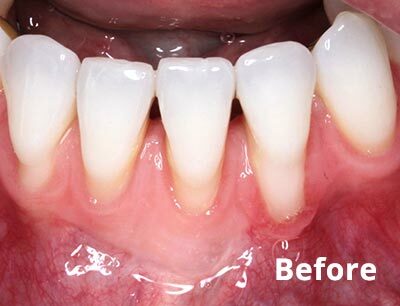 If you are unfortunate and still suffer from receding gums, see your South Calgary Periodontist and ask about grafting procedures to see if you would be a candidate. 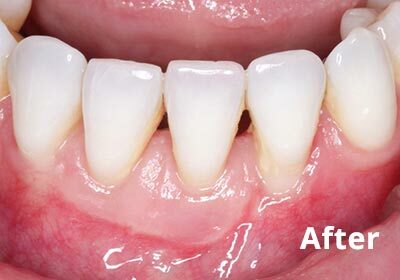 Remember – there is more than one way to fix receding gums while still making your smile more natural and appealing! At South Calgary Periodontal Group, we are always welcoming new patients. Call us at (403) 278-5446 to book your Gum Grafting consultation appointment today!